Initial Impressions are everything. Your van and equipment can tell your customers a lot about you and your business. TracRac Dodge and Mercedes Benz, Sprinter, Promaster and Promaster City 2 Bar Aluminum Utility Van Ladder Racks are slick looking and construction tested. 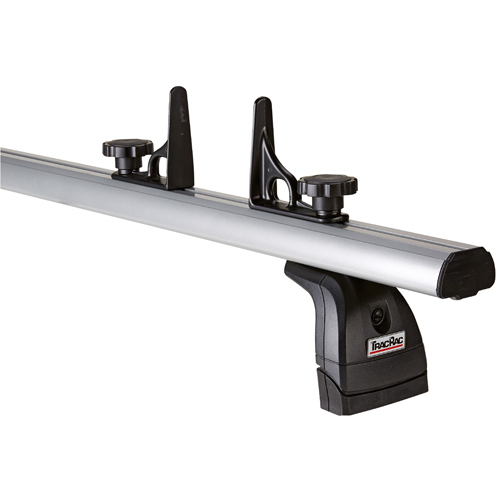 The Sprinter, Promaster and Promaster City 2 Bar Aluminum Utility Van Ladder Rack Systems include custom hardware that easily attaches the rack system to the factory fix points located in the roofline. Carry up to 500 pounds of ladders, lumber, conduit, piping and other long, bulky items that won't fit comfortably inside your van. All Sprinter, Promaster and Promaster City 2 Bar Racks feature no rust aluminum construction with dual stage powder coating to resist wear and tear. Sprinter, Promaster and Promaster City 2 Bar Aluminum Utility Van Ladder Racks will last the life of your vehicle and beyond. TracRac's Limited Lifetime Warranty supports that promise. TracRac Dodge and Mercedes Benz, Sprinter, Promaster and Promaster City Utility Van Ladder Racks include 4 Sliding Aluminum Load Stop Tie Downs, all mounting hardware and instructions.